Red peppers, celery, carrots, and cucumber- all chopped. Raw vegan Italian salad dressing. If not this, then use olive oil or any other dressing that you prefer. 1) Place the kidney beans, chick peas, edamame, and peas into a large bowl. 2) Add the chopped veggies and your seeds. 3) Add the dressing and then stir it all together until everything is well mixed. 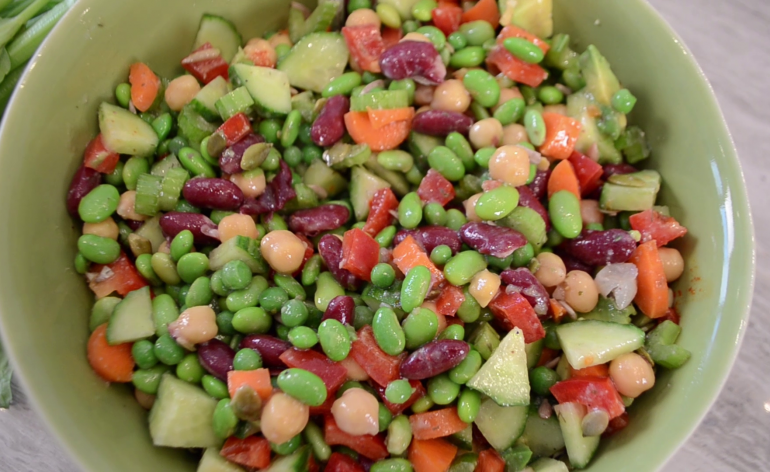 There you have it, a healthy and delicious vegan bean salad that will be a delight for you to feed to your family. In addition, since it is healthy for your family, you can feel good about giving as much as they ask. So, why not try this recipe tonight! Michelle Cass is a true inspiration. She is a mother, business owner, nutritionist and leads a completely vegan lifestyle. Her enthusiastic approach to food, taste, health and creativity contributed to the co-founding of RawFoodz Inc. This company is where products are a supreme blend of super and organic whole foods that carry immune-boosting properties, a broad spectrum of vitamins and minerals, high fiber content, essential fatty acids, protein and antioxidants. RawFoodz brings a pure and delicious line of nutrient-rich dressings and spreads to national grocery stores. One taste of this product and you will be hooked! Follow RawFoodz on Twitter @Rawfoodzinc or find them on Facebook under RawFoodzInc.